Ever since Unplugged Courtyard opened up in Connaught place, it has been loved by all for its beautiful decor and distinctive menu. And just when we thought it couldn’t do better, Unplugged Courtyard launched a completely new Monsoon Menu encompassing a variety of coastal flavours. 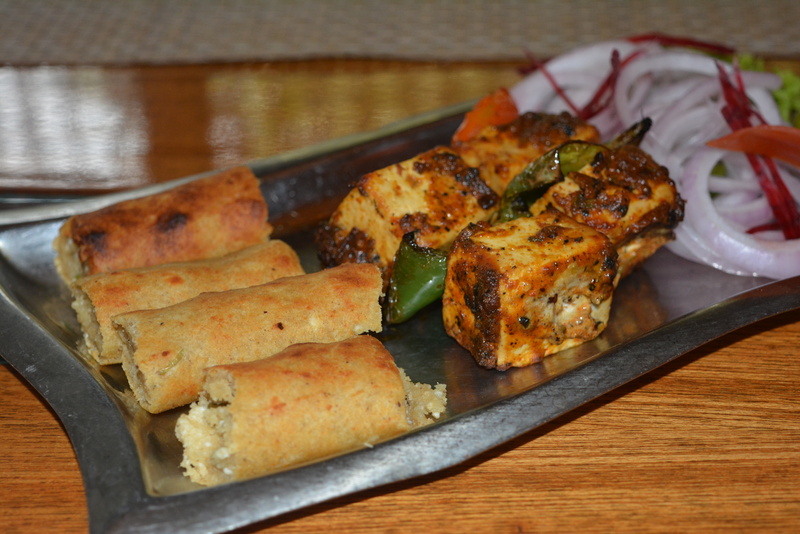 The Monsoon menu has some exciting appetizers along with mind blowing drinks and desserts. Monsoons are always pleasant; giving us relief from the scorching heat and Unplugged Courtyard is the only restaurant that celebrates this season with a new exciting menu for its patrons. The drinks on the menu are tantalizing and uniquely presented. I first tried the Fruity Mojito Well which was a beautiful blue drink served in a huge glass bowl with cute multi coloured straws and chopped fruits. Served in a fresh coconut shell, Malabar Mojito was another drink that caught my attention. A cocktail with coconut water and rum, the Malabar Mojito was an absolute monsoon delight. Stuffed with a generous amount of cheese, the Corn Asparagus Fritters were utterly flavourful and the best among vegetarian appetisers. The Palak Patta Chaat was made with fresh ingredients including crispy spinach leaves topped with curd, chutney and pomegranate seeds. The non vegetarian appetisers were an absolute delight to the palate. Thrice Cooked Lamb with Hoisin sauce was a crispy lamb based appetiser that had the adequate spice. My favourite was the Banana chicken that had circular disks of tender chicken cooked in sweet chilly onion sauce served with crispy banana chips. The chicken was really succulent and delicious. Another non vegetarian appetiser that stood out was the Monsoon Murg Kebab. I expected the kebabs to taste like any other north Indian kebab dish but these were coated in south Indian spices along with a creamy coconut based sauce. The desserts were the most anticipated part of the meal as a dish called Cutting Chai Freezer sounded really appealing. The new menu has two very different yet super delectable desserts. The Cutting Chai Freezer was the frozen version of creamy tea with nicely infused flavours of vanilla and cardamom. The pumpkin pie was a soft pumpkin and milk based dessert wrapped in a crispy sheet served with caramelised form of the same ingredients. The pumpkin pie was the highlight of the entire meal for me and I would definitely visit again just for a chance to have it again. 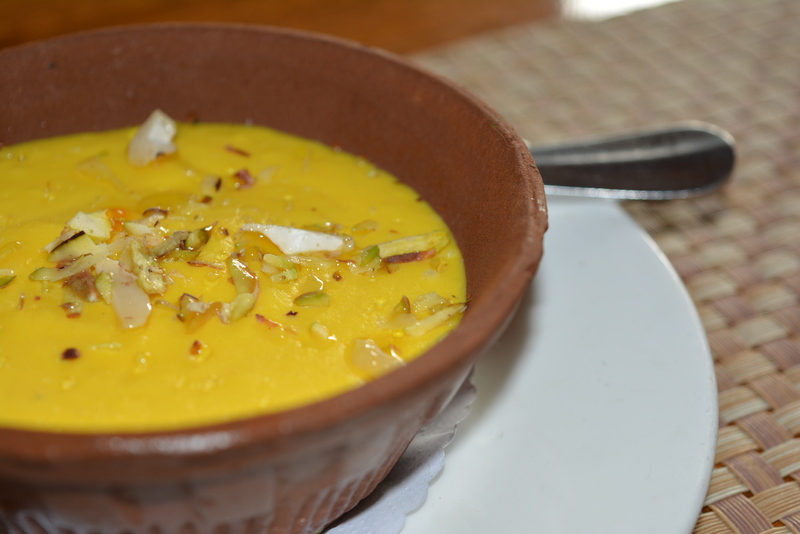 Overall, the new Monsoon Menu is very enticing and brings innovation to the regular menu option. It is a unique way of introducing new flavours to the North Indian palate and should be given a try! There are many places in CP and Janpath where you can grab a quick bite. But with most of the places offering junk food, the health conscious people are not left with many options. Cottage Café by Smoothie Factory is one of the myriad options to satiate your taste buds in Janpath but most of the items on their menu are low on fat, thereby giving you a healthy meal. After a fun filled and exhausting Rahgiri session at CP, one could easily make a pit stop at Smoothie Factory and indulge in their toothsome delicacies. The place is located adjacent to the Cottage Emporium. If travelling by metro, get down at gate no. 3 of the Janpath Metro Station. The interiors are done up in vibrant colours which lend it a playful vibe. We began our tasting session with Very Berry Smoothie and Peanut Butter Powerhouse Smoothie. The Very Berry Smoothie had a fruity flavor with the unique combination of strawberries, raspberries, blueberries and soy milk. The quantity was quite generous as well. It was light on the stomach and high on nutrients. On the other hand, the Peanut Butter Smoothie was loaded with PBJ. While I am a fan of cold beverages which have a thick consistency, this one was way too thick and drinking it with a straw became a big task. The Citrus Walnut Salad was simply divine. Fresh lettuce tossed in a citrus dressing with a few walnuts and almonds thrown in made for a healthy snack. The Southwest Chicken Flatbread was another jewel in their menu. With a crunchy base topped with corn, jalapeno and chicken shreds along with a little cheese, it made for a scrumptious snack. B eing a waffle lover, I couldn’t leave without trying their Multigrain Waffles. The Caramel Waffles had a strong aroma of Caramel but not the flavor. The tiny scoop of Vanilla Ice Cream and White Chocolate sauce lent it some flavor. Same was the case with the Banana Walnut Waffles which was saved by the caramel. Also, the waffles were raw from within which was a big disappointment. They did not give us any knives and plastic forks weren’t enough to cut through them. Smoothie Factory has a huge name abroad and the franchise has begun to set the tone in India as well with the opening of two outlets in Delhi. But this outlet has rather big shoes to fill. The economical rates and colourful interiors work in its favour but a few dishes need to be worked upon. Their flatbreads and salads are highly recommended though. Gurgaon, the millennium city has been exhibited as the best city to work and live in. It offers a luxury lifestyle that is enjoyed by its residents as well as sojourners. A new addition to Gurgaon’s congregation of leisurely amenities is a beautifully built club by Vipul Group called the V club. Located on a busy Sohna Road, V club offers a lavish getaway from the demanding city life. With unparalleled facilities like a multi-cuisine restaurant, cafe and bakery, fully functional sports arenas including Tennis courts, Squash courts, Table Tennis rooms, a fully equipped gym and swimming pool, V club has become the most preferred destination in Gurgaon. What exceeds expectation is the 24 seat movie theatre which gives an experience as good as the PVR gold class. Well, this is not it; the bar at the club is known for its unique cocktails including the V-club cappuccino and kaffir lime watermelon margarita. The V-club cappuccino is an absolute treat to your palette as it provides well blended flavours of pineapple juice, lime juice, cinnamon, cardamom and egg whites. Last weekend the V club invited us for a Bartending and Cooking Master class with the well renowned chef S.K Bhaskar. The master class included a bartending session where we got watch and learn how to make their signature cocktails. A cooking master class followed the bartending session that demonstrated appetizing dishes like meat ball pasta and broccoli and cheddar stuffed potato skins. The chef very eloquently demonstrated the steps involved in cooking each dish followed by a tasting session. The meat ball pasta was perfectly cooked in a mixture of red and white sauces enhancing the flavours of meat balls made with Indian spices. The broccoli and cheddar stuffed potato skins stole my heart as they were stuffed with ample amount of cheese that melted upon heating and gave an ideal smoky flavour to the dish. For lunch we were served Mutton seekh kebabs that were prepared with minced meat mixed with fresh crunchy vegetables. 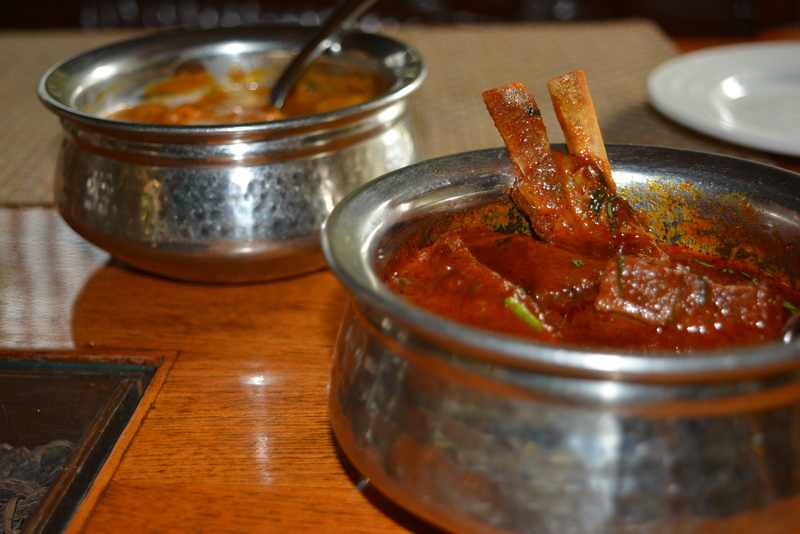 The main course included Butter chicken, Mutton Rogan josh, Chicken Biryani served with Raita and a variety of naans. Everything tasted absolutely fulfilling and I thoroughly enjoyed lunch. V club offers a great overall experience to its members ranging from an unmatched dining to various periodical activities like Movie screenings, Zumba classes, Yoga classes, and festival celebrations among many more. V club is a true Gem stone added to Gurgaon’s luxury and I definitely wish to experience everything again. Bakar. One word that encompasses many emotions. On word that can be used in different situations. In a Kashmiri household, it changes to “bakhar” when someone wants to say, “You guys have so much capacity for talking nonsense.” That’s what Bakar stands for. The universal right to talk utter nonsense and not be judged for it. GTB Nagar is an area full of cafes frequently thronged by students who are forever looking for a spot to chat and have good food. Bakar- The Café stands true to its name giving you a homely environment where you can just plonk down and bakar around with your friends over some fine food. The owners Anubhav Sapra, Swati Singh and Rahul Bhardwaj have made every effort to give the café a homely vibe. Moda Stools, small cane and wooden tables, funky wall art and beautiful lanterns beautify the place. It isn’t as big as the other cafes in its vicinity but that’s where its beauty lies. Bakar is a ‘chhota packet bada dhamaka’! Don’t judge the place by its area. The menu consists of several varieties of Momos, Maggi, Shakes and egg dishes. It also has a few breakfast options like Pancakes and Crepes and soon they plan to introduce a full-fledged breakfast menu. The co-owner, Mr. Anubhav Sapra is himself an avid foodie and has curated a menu keeping in mind the college crowd which prefers meals that are easy on the pocket. The Alfredo Maggi is good but adding a few veggies could make it even better. Butter Chicken Maggi was undoubtedly my favourite dish here. Butter Chicken and Maggi are two dishes that you can seldom go wrong with. And when such dishes come together there is bound to be a culinary explosion in your mouth. Thankfully, the pieces of chicken were quite abundant, thereby, not making you feel cheated. The typical aroma and flavor of Butter Chicken ensnares your senses making you ask for more. The bowls in which they are served are adorable! Bakar serves a wide array of momos. Amongst the vegetarian ones, my favourites were the Spinach Momos and Potato Momos. The Spinach momos are extremely delicious and surprise you with their novelty. The Aloo Momos were a clear winner in this category. This is perhaps the first café in Delhi that serves Aloo Momos. Smooth and delectable, the filling takes you by surprise and tastes best when paired with mayonnaise instead of the traditional spicy chutney. Mushroom Momos were again something I hadn’t heard of before. Finely chopped mushrooms are used as the filling and believe me, it is something you do not wanna miss! Let’s admit it; Paneer Momos is for days when your mood lies between veg and non veg. And the chef at Bakar does it really well with tiny dices of savory Paneer filled in the momos. The Veg Momos is a classic and you can never go wrong with it. The Chicken and Mutton Momos were extremely well made but the latter took the trophy home. I am a chicken lover but those juicy pieces of mutton stuffed in the dumplings tasted way better than its chicken counterpart. My only complaint is that the covering of most of the momos was a bit dry and hard. To wash it all down, try their cold coffee with strawberry ice cream. It is the weirdest combo I’ve ever heard of. I utterly dislike strawberry ice cream and when this was brought to me I cringed from within and had half a mind to send it back. But the Cadbury Gems and colourful sprinklers prodded me to gather courage and take a sip. After that there was no stopping me. The coffee prevented the strawberry from taking the front seat and created the perfect blend of flavours. At the end, you are rewarded with a fortune of gems! Kudos to Chef Kapil who brings a plethora of flavors to your plate and palate. 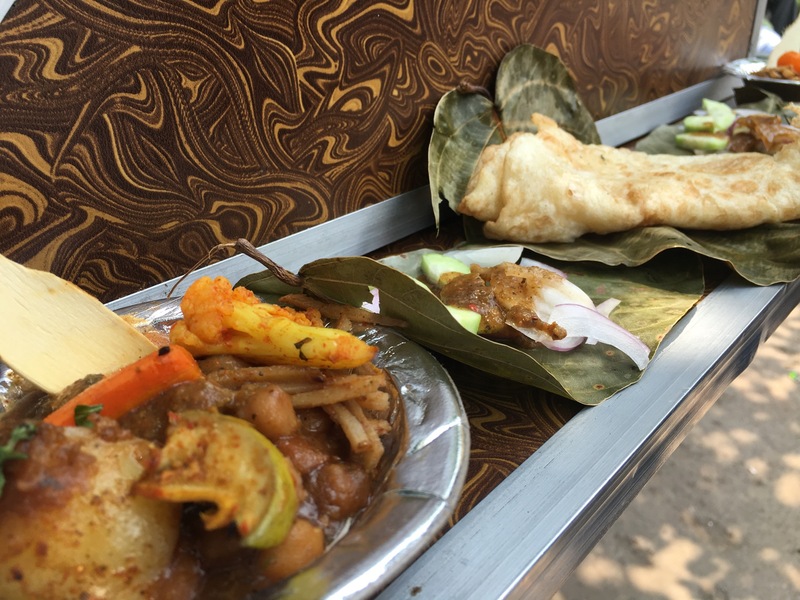 Bakar also employs a differently abled staff which brings your order to your table. A jovial man, his laughter is infectious and is sure to make you smile even on a bad day. It is heartening to see that humanity still exists. To begin with, let’s admit that Hostel life is bittersweet. It’s a great learning experience as you get out of the controlled and comfortable familial environment and become more independent. However, responsibilities increase and you live on a tight budget. And if you’re a foodie like me, eating out becomes difficult and you have to do a research on the cheapest places to eat out. Hostel mess is mostly a ‘mess’ and you’re left with two options; either go hungry or do some jugaad to calm your hunger. Thankfully, instant foods have made hostel life way easier than what it was for our predecessors who relied mostly on the nearby snack outlet or gate crashing weddings (still happens!). So with a little help from a few hostellers, we aim to be your hostel food guide. Here’s how you can save money and be lazy, all at the same time without giving up on your health. Maggi is the king of all instant foods and thus deserves to be on top of the list. It may not be ready in ‘2 minutes’ but it definitely is a life savior. ALWAYS stock up on Maggi packets because when hunger strikes, nothing can cure you better. Chings is another instant noodle brand that you can try when looking for something different. Their Hot Garlic Noodles is a personal favourite. It’s spicy and absolutely delicious. Saffola Masala Oats and Quaker Oats is something health freak students swear by. If you’re the kind of person that is constantly measuring the calories in each and every food item, fret not. Oats is a nice way to stay friends with the weighing machine. It is quick and wholesome. “You can’t have Maggi every day. It becomes monotonous. Moreover, it’s isn’t very healthy if taken on a regular basis. I store ready to eat packets of Lemon Rice, Rajma Chawal, Upma and Poha from MTR. Its quick and quite yum”, says Aditya, a student of DTU. We couldn’t agree more! Its summers and what better way to stay hydrated than a chilled glass of Chaach? “I am a huge fan of Amul Chaach. Since I share a flat with two other girls, we buy large tetra packs and beat the heat with a glass of Buttermilk”, says Shraddha, a student of UPES, Dehradun. As basic as it may sound, don’t compromise on your protein intake. Have it with cookies (awesome combo) or if your hostel/ PG/ flat has a blender, make a simple milkshake. You will also need milk if you want to make Tea or Coffee. Another dairy product in this list should tell you that they are an important part of your diet which you shouldn’t let go. Aditya recommends Mother Dairy’s flavored yoghurt and milk during summers. Another way to stay hydrated is a pack of Rasna or Tang. Preeti from Ambedkar University says, “It’s healthy and many hostellers store a few sachets of Rasna when in need of a cooling drink.” Also, isn’t it a great way to relive those childhood memories? Both, Preeti and Aditya espouse the use of instant soup sachets. Truth be told, it does make for a great evening snack/ beverage. There are also ‘Cup-a-soup’ sachets sold by Knorr for a meager 10 bucks which is enough for one person. Shraddha prefers to visit a nearby tea stall for her daily dose of chai or coffee while Aditya and Preeti prefer to keep a few sachets handy. “I recently tried Wagh Bakri’s instant Masala Tea which is ready in just 2 minutes and is pretty good. Also Nescafe sells Cappuccino sachets which is a great help during all nighters”, says Aditya. Along with instant coffee, Preeti also suggests stocking up on Iced Tea sachets. Sprinkle some salt or chaat masala to make a fruit salad and binge watch your favourite TV show. Getting late for class? Grab a fruit and munch on it while you rush to and fro for lectures. Packed with a bevy of nutrients, it is something that you shouldn’t miss out. Tropicana and Real Juice are bound to be your best friends. There is seldom any time in the morning to gulp down a fruit and that is where packaged fruit juices save the day. Run like The Flash while sipping on a tiny tetra pack and you have your nutrient quotient for the day intact. There are many other options but these are the bare necessities to survive your hostel life. You and your mates are sure to come up with tons of combinations with the above mentioned things. Let your creativity flow! The Junkyard cafe has been a crowd favourite in Connaught Place and Rajouri Garden since its conception. Its innovative decor and distinctive menu has been highly appreciated and recognizing the increasing love from customers, it has now opened a new joint in Saket. Located behind Select city walk, the cafe serves ambrosial delicacies, cocktails and hookah in a colossal space. Doing justice to its name, the decor of the cafe is brilliantly done with recycled junk material and salvaged scrap. The menu integrates a variety of Indian, Mediterranean and Asian delicacies along with a wide range of refreshing drinks. Our gastronomic experience at the cafe began with Bhatti ka murg and classic chicken tikka served with fresh fruit mocktails. Both the chicken starters were cooked well with ample amount of spices and were an utter delight for our taste buds. The drinks that I tried were Gardino – a sweet amalgam of watermelon, beetroot and celery, and Minto Plus – a refreshing mint based watermelon lime drink. Next were the all time Mediterranean favourites Hummus, Pita and Falafels. The presentation was beautiful and the taste was equally good. Amongst the appetizers, my favourite was the Palak Patta Chaat, which was absolutely mind blowing. Chaat is a weakness for most of us and when it is innovatively mixed with healthy ingredients I simply cannot resist! The Palak patta chaat is super light, crispy and is definitely on top of my recommendation list. Another appetizer I enjoyed was cilantro chicken which has a nice after taste of peanuts. The cafe has some wonderful dishes for vegetarians as well that include crispy baby corn, Junkyard style paneer tikka, veg spring rolls, hara bhara kebab and vegetable sushi. I personally liked the crispy baby corn and hara bhara kebabs as both the dishes had a very fresh taste of greens. For the mains, I tried peri peri chicken pizza which was good but wasn’t as spicy as I expected it to be. I also tried non-veg sushi platter and grilled fish which were both delicious. The salmon sushi was delish and I’m definitely going to order it the next time as well. For main course the cafe also has really yummy Thai curries served with steamed rice. For desserts we had tiramisu and chocolate brownies served with vanilla ice cream. The tiramisu really won our hearts with its unique preparation and taste. Overall the cafe is very vibrant with an energetic vibe, the service is quick, and the staff is extremely attentive. Not to forget, the food is a total value for money. Hudson lane, the most iconic lane for all college students, is the food hub for Delhi University attendees. During my time at Ramjas College, for all celebrations however big or small everyone would crowd at the renowned Zee Chicken (for those who lived in the north campus) or the famous Pehalwan Dhaba to remind oneself of home. When one closed the other opened, ACP dhaba and Friends Dhaba are the best examples. Here you were served a never ending tower of chapattis and the traditional Indian sabzi, which was an amalgamation of the season’s fresh produce. With the ongoing food buzz, where customers want to explore new cuisine fusions in a lounge like atmosphere, Hudson Lane too is now jam-packed with cafes. Despite being exposed to the changing food scene a handful of restaurants are still true to their roots. 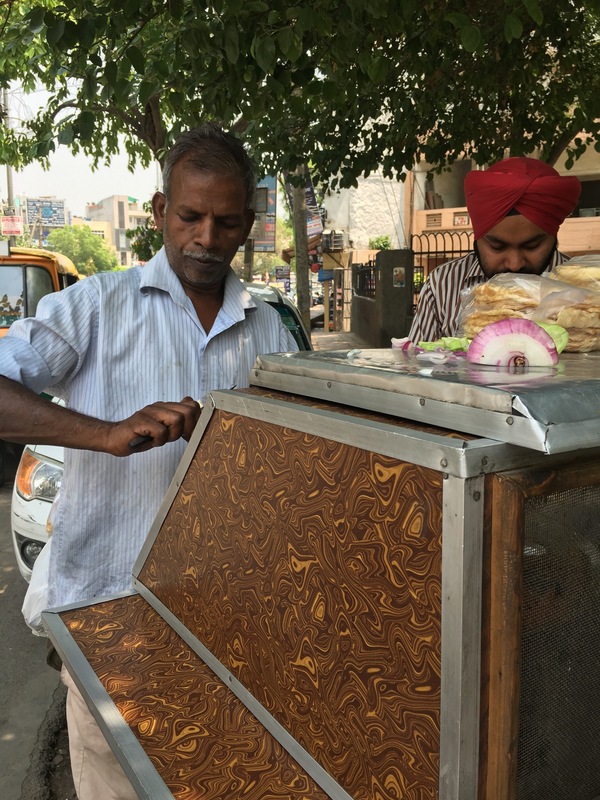 Charan Singh’s food van is not only known for it’s shahi paneer chawal but also for the chef’s amicable personality and a smile that no one can wipe off. His piping hot rajma chawal and aromatic kadi chawal are not only relished by the campus students but also all the near by office employees with whom he indulges in friendly banter. Recently, I had the pleasure of trying Surinder ji’s ‘Chole-Bhature’. What makes his dish different from others is the unconventional flat bhatura. He makes the preparation quite interactive which is a sight for sore eyes. He grins from ear to ear while preparing a dish he seems to love; not even dicing an onion could make him frown. The Chola and Bhatura are served with chutney, a garnish of coriander and a side of a cornucopia of pickles. 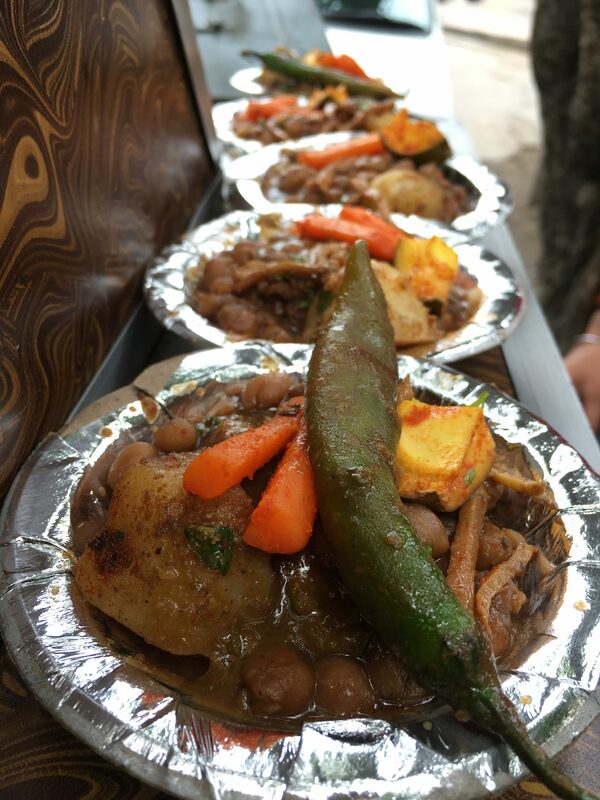 For 16 years he has been plating this delectable delight and is an affordable treat for all DU students. Address- Police line, Vijay nagar, next to Bakar café. DLF cyber city is always bustling with lively cheerful crowd as it offers a variety of choices to the food lovers, ranging from coffee shops to microbreweries to north Indian fine dine restaurants. Out of the numerous options, one particular eatery that stands out is California Pizza Kitchen, serving authentic Californian food. The exciting news is that this month, California Pizza Kitchen has The Zesty Mexifornia Festival on! The culinary team at CPK has very carefully crafted a special Mexican Menu that features appetizing Mexican delicacies like taquitos, tacos, bean fritters and crunchy salads. The festival menu also presents some new refreshing beverages from which I tried the peach and apricot margarita. The drink was chilled as it should be and tasted perfectly balanced in terms of flavours. 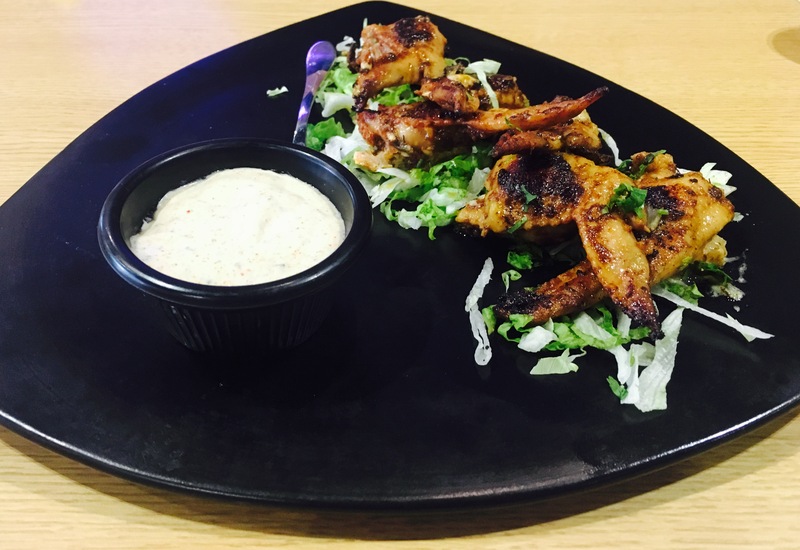 The first appetizer I tried was the Chipotle stuffed chicken wings presented beautifully with fresh lettuce and yoghurt dip. The wings were stuffed with bell pepper, jalapenos and cheese tossed in hot chipotle sauce. However, the wings were not as spicy as I expected. The next item on their menu that I got to try was the Chicken Tacos. The stuffing was coated with hot sauce tossed in garlic and onion, giving it a wonderful flavour. The tacos stole the show and have to be the best dish on their new Mexifornia festival menu. The Mexican veggie pizza is made with a super thin crust topped with a variety of fresh vegetables. The spicy bean sauce used for the pizza makes it taste very different and unique as compared to regular pizzas. Who doesn’t enjoy a good twist? The unusual taste is the reason I absolutely loved their Mexican veggie pizza. Another thing I tried from the festival menu was the Fajita Fusili pasta that was cooked in a creamy garlic sauce served with garlic bread. In every bite I could taste fresh crunchy vegetables and the cilantro garnish made it all the more delicious. The meal ended with a very unique dessert called Apple Taquito. 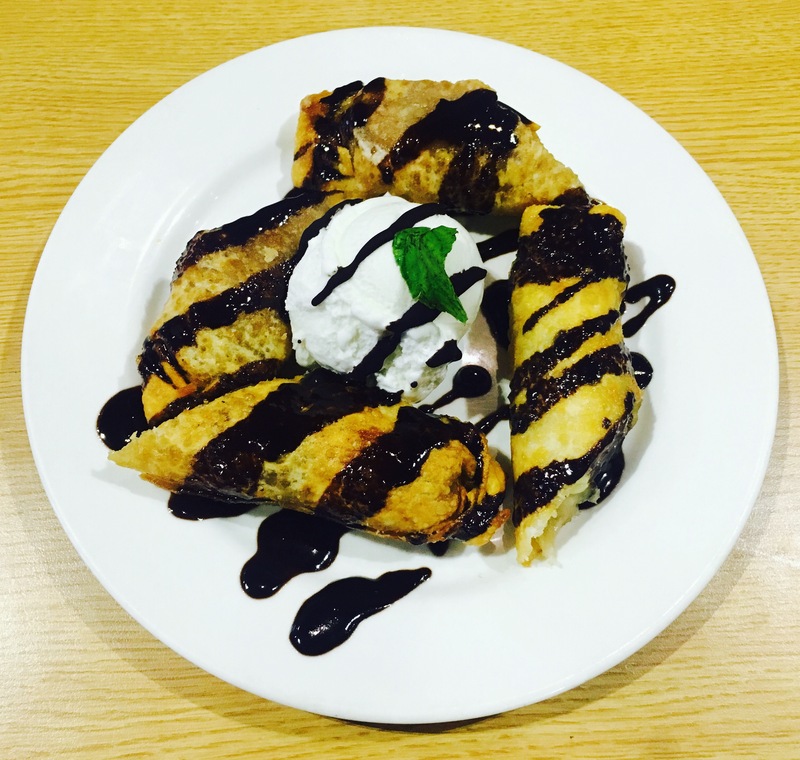 This dessert was made with cinnamon spiced apple filling stuffed in flour sheets that were deep fried, served with vanilla ice-cream. The crunchy dessert had a distinctive cinnamon flavour which complemented the sweetness of vanilla ice-cream extremely well. This restaurant does not just stand out for its food; the staff is remarkably amicable and attentive to the customers. The ambience is minimalistic yet modern with a large seating capacity. Overall, California Pizza Kitchen is an impressive joint and I would definitely visit again!